Elephant and Castle remains one of the most dangerous and unpleasant junctions in London despite Transport for London spending £25m redesigning it in 2015. How did such a unsafe & unpleasant junction get built in 2015 and what can be done to fix it? It's a saga of wonky objectives, dubious pressure groups, hasty politicians, and the trumping of development over transport needs. Download the dossier on the designed-in dangers of The Elephant & Castle's new road layout, also known as "The Bend". Edition 2, March 2017. 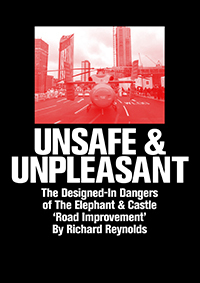 Campaigner and author Richard Reynolds has been shaping public space at Elephant and Castle since 2004, both as a guerilla gardener as well as champion for the improvement not destruction of safe segregated pedestrian space. He has a degree in Geography from Oxford University and is an enthusiastic pedestrian, cyclist and motorist.